This week, I'm spending a few days in Toronto with my family. Staying in the northern suburbs means that I do a lot of my eating up in the 905 area code, but the one thing I love about Toronto is that amazing food can be had even way outside of the city limits. On my first night in town, I invited my siblings to join me at an old, favorite haunt of mine at the corner of Hwy 7 and East Beaver Creek: Caffé Demetre. 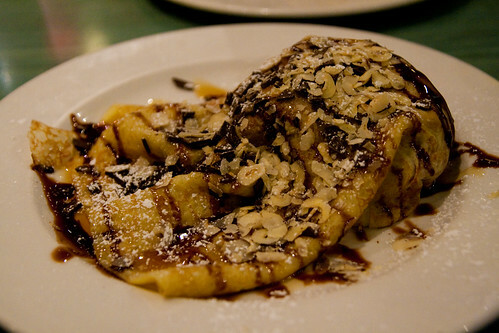 Caffé Demetre is a dessert cafe specializing in ice cream, crepes, waffles, and other sumptuous delights. It has been around for 20 years, with locations both in and outside of Toronto. For as long as I've been a fan, Caffé Demetre has always been packed, especially late in the evening. This night was no exception - we arrived at 10 pm and the waiting crowd was so large that I could barely get inside the entrance. Our 40-minute wait was torturous because we had to endure all the mouth-watering desserts being made in the tiny kitchen area right behind where we were standing. But at long last, we were seated. And for as long as I've been a fan, Caffé Demetre's menu hasn't changed much, save for the prices. I ordered the trusty Rusty Pelican crepe, with Nutello iced cream, butter-caramelo and triple fudge sauces, dark chocolate chunks, and roasted hazelnuts. It was a highly satisfying dessert! Lil Sis had a create-your-own crepe with vanilla ice cream, fresh strawberries, bananas, and caramel sauce, which she had thought there was no way she could finish, but she liked it so much she cleared her plate. Lil Bro had a slice of red velvet cake with strawberry ice cream on top, which he enjoyed as well. If there is one oddity I had noted about this place, it is that it seems to be very short on wait staff as they were always busy and hurried, while possibly too many staff were working the kitchen as most of the time they were standing around with nothing to do. That said, it was undoubtedly another fun night of desserts at Caffé Demetre, and despite the long wait, we enjoyed ourselves. How did eggnog come to be associated with the winter holidays? I have no idea, but there is nothing like a good eggnog to get me in the holiday spirits. I made this cooked eggnog for the first time last year and it was a huge hit among my friends, so I decided to make this my Christmas dinner contribution this year. My eggnog is lighter in color than in the picture from the recipe mostly because I skipped the yellow food coloring, and could in part be because I used Egg Beaters (made with all egg whites) instead of actual eggs - which, by the way, shaved 55 mg of cholesterol from each serving of eggnog, even though that was not the reason for the substitution in my case. One thing I've learned the hard way, having made this several times, is that one must use one of the smaller/weaker burners on the stove when cooking the egg mixture, as a "PowerBurner" burns the egg quickly, even with constant stirring. 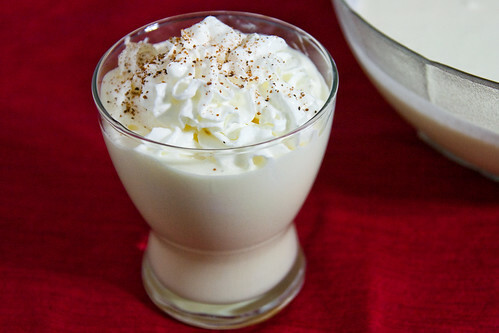 Today I am bringing one batch of spiked eggnog and one batch of "virgin" eggnog to Christmas dinner. I hope the family will enjoy this holiday favorite of mine as much as I do! On a recent trip to the Strip District I noticed that a Thai restaurant had just opened on Penn Avenue between 19th and 20th Streets. Yippee! I was just thinking that I need more Thai food in my life! So when R.'s mom came to town last weekend for a visit and to do some Strip District shopping, we thought Little Bangkok In the Strip would be the perfect place to lunch. The restaurant occupies a space that's narrow but deep, with brick walls, exposed pipes, and a very high ceiling. The decor is simple, yet cozy. It definitely has a contemporary look and feel. I'll admit that the atmosphere got me a little concerned that the food wouldn't be very authentic, but it turns out I really shouldn't have judged this book by its cover! After we placed our orders, we were surprised with bowls of Daikon Radish Soup, compliments of the chef simply because it was a cold day out. How nice! 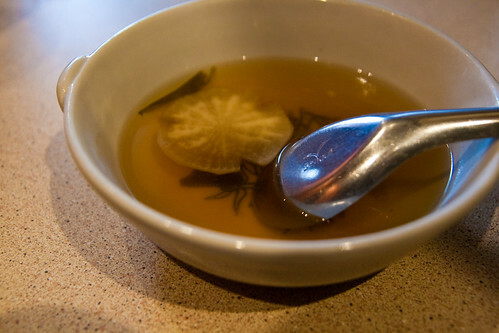 The soup is a seasoned light broth with slices of daikon radish, and is very well done. Because I can never resist curry, I ordered the Green Curry, and selected duck as my meat of choice. 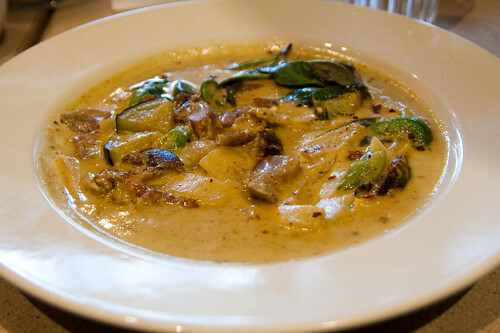 This coconut milk-based curry comes with Thai eggplants, bamboo shoots, bell peppers, and Thai basil. 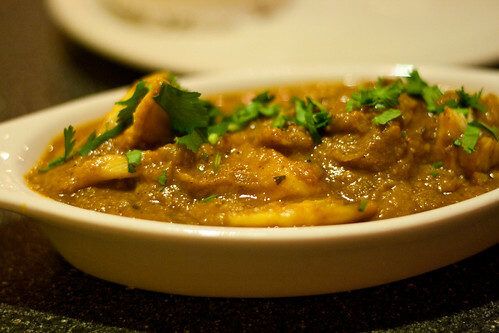 While the duck was a tad overcooked in some spots, it was overall a very, very good curry. 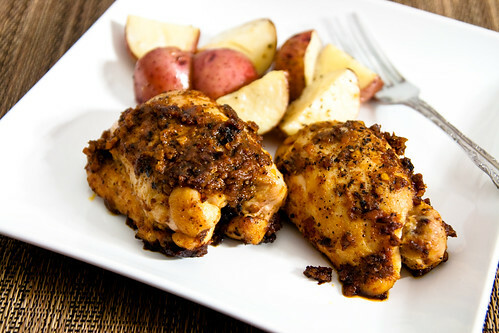 It is flavorful and packs just the right amount of heat. While the price is a bit high, the portion is also very large. I actually took a whole half of this home, so I got two meals out of $15. Not bad. Not pictured is the rice that came with the curry, and diners have the choice of white, brown, sticky rice, and more. R. ordered the Thai Rama Chicken. 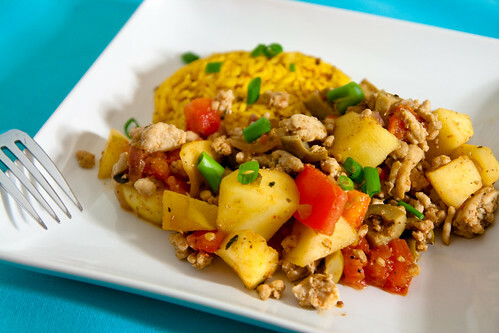 The chicken is cooked in yellow curry and is served with veggies and a homemade peanut sauce. 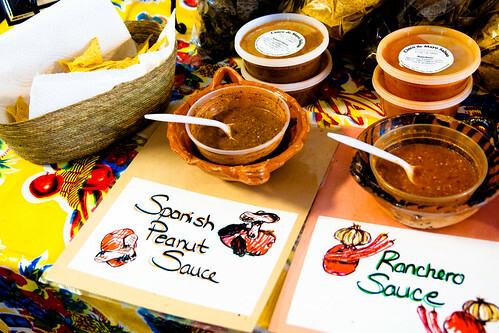 The peanut sauce, in particular, was great! R. had also ordered a Ginger Tea, of which I do not have a photo, but I had a taste of it and it was really delicious, chock full of fresh ginger taste though sweeter than expected. I would think it is possible to ask for an unsweetened version though. I hope so anyway. R.'s mom had ordered the Sweet and Sour with vegetables. The sweet and sour sauce is homemade, and the veggies included tomatoes, onions, pineapple, cucumbers, and bell peppers. R.'s mom kept commenting on how the veggies were cooked to perfection - that is, cooked but still crunchy. We all loved the food. I later discovered from Pop City Media's write-up that Little Bangkok's chef, Pornpen Thammasaroret, moved to the US from Thailand not too long ago, and what she serves is what she grew up learning to cook. Not that I'm in any way an authority of authentic Thai cuisine, but I'm really not surprised by this after enjoying our delicious meal at Little Bangkok. What a great addition to the Strip District! About a month ago I wrote about the amazing Smoke BBQ Taqueira. 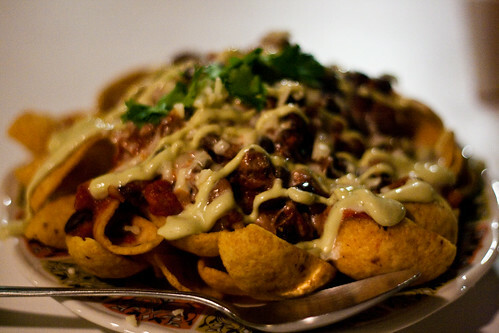 Smoke has since expanded its menu and its hours, and I was back recently to check it out. As per usual, I got two tacos and a side. My first taco was the Brisket Taco, with sauteed onions, hot peppers, and BBQ mustard sauce, which was the remaining taco on the old menu that I had yet to try. As expected, it was very tasty. My second taco was the Chicken Apple Taco. 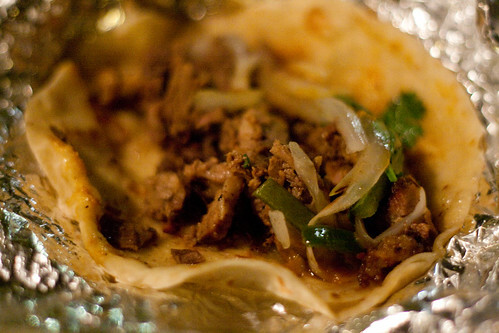 I had first read about this taco on Señorita Cibulka's blog when it was offered as a special item earlier in the fall. It sounded delicious, and I was disappointed that it was not available during my two previous visits to Smoke. 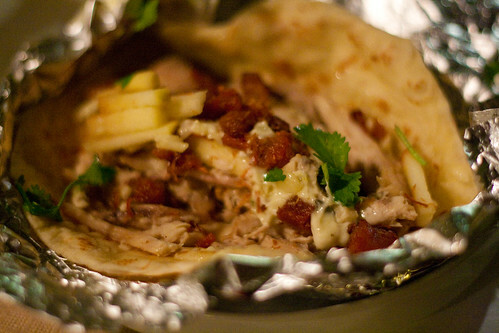 But I was very excited to see that the Chicken Apple Taco has now made its way to the regular menu! And I loved it! The combination of chicken, apple, bacon, cheddar cheese, and smoked jalapeno mayo was just fabulous. I think this is my favorite Smoke taco so far! 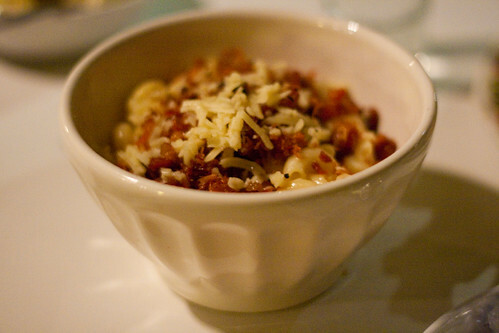 For my side, I couldn't help but get the Mac n Cheese with Bacon again because I had been thinking about it a lot pretty much since I had it on my last visit. The price has gone up somewhat since Smoke unveiled its new menu, but the portion is also bigger. I actually had to take most of this home. My dining companion, Señorita Cibulka, got the new Frito Pie. 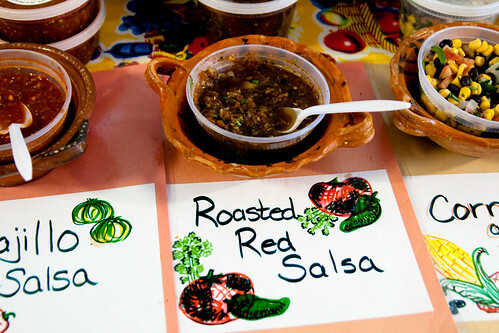 That's in addition to tacos, of course. I got a few bites and a photo. This is very tasty, and be warned: it is quite large and filling. Definitely an item more for sharing than for enjoying on your own. Unless you have a big appetite. All in all, it was another highly satisfying meal at Smoke. 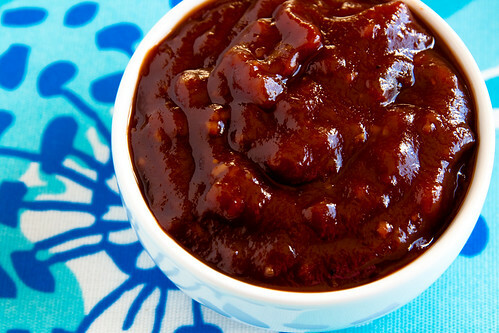 In my last post I talked about making a fabulous Bourbon Whiskey BBQ Sauce with some of the leftover bourbon I had. 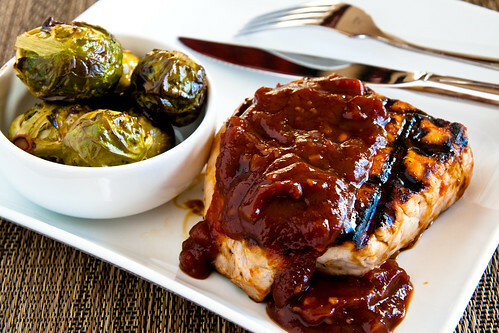 I thought the BBQ sauce would go well with pork chops, so I tried it out for dinner that night. First, I sprayed the grill plates on my George Foreman Grill (the only grill I own!) with cooking spray and preheated it at the highest setting. I cut several slits through the pork chops, and then seasoned them with salt and pepper and brushed them with the Bourbon Whiskey BBQ Sauce on both sides. I grilled the chops for about 5 minutes (both sides together), and then lowered the heat and continued grilling until done, about 5-7 minutes more. Finally, the chops were served with additional BBQ sauce. Soooo delicious! For Thanksgiving I had bought a bottle of bourbon to make this Sweet Potatoes with Toasted Pecans. However, after using only 1/4 cup of the bourbon, most of the bottle was just sitting on my counter top, and I needed new ideas for ways to use it up (other than drinking it straight!). So off to Google I went in search of recipes using bourbon. 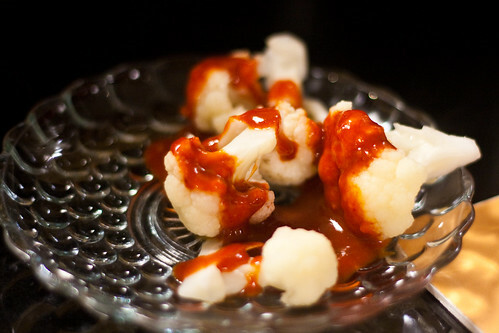 I came across this barbecue sauce recipe that sounded awesome, so I tried it last weekend. And awesome it was! I then used this flavorful sauce on my pork chops with amazing results. Check it out in my post here! A visit to Root 174 had been a long time coming. I had been watching with curiosity since I discovered that Chef Keith Fuller had left Six Penn Kitchen to open up his own shop, and I welcomed the news of the restaurant opening in Regent Square in the summer with excitement. Soon after its opening, a friend who lives in nearby Swissvale and I had talked about making a trip to Root 174. So I waited. And waited. And waited. And then life got in the way and dinner plans at Root 174 just never happened as intended. Finally, I decided I was done waiting, especially after fellow blogger friends raved about it nonstop. The first opportunity I had to choose a restaurant for a date night, I picked Root 174. 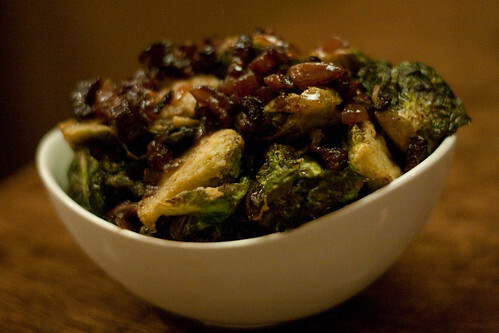 We started with the Crispy Brussels Sprouts with Black Pepper Bacon Jam, which is technically a side item, but we had it as an appetizer. Friends had talked about how much they enjoyed these brussels sprouts, and I'd have to say I was a bit skeptical at first as I've never really had brussels sprouts that I was crazy about. But these...wow. 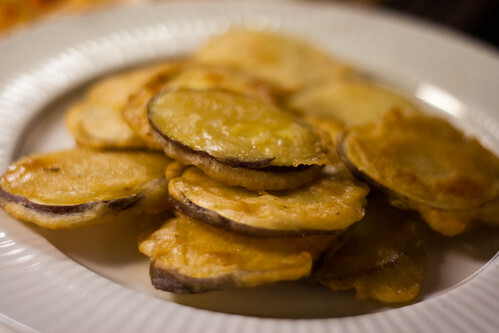 These really were amazing: Crispy on the outside, soft on the inside, and taste like they had been thoroughly marinated in some candied concoction. I had always found brussels sprouts to be somewhat bitter, but these actually emitted a hint of sweetness. We devoured them in no time. I have even been inspired to make my own brussels sprouts for the first time in my life, though I've yet to replicate Root 174's heavenly version. 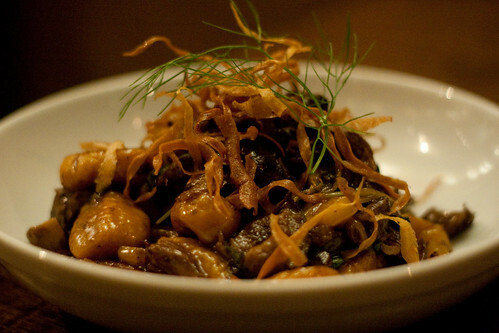 My entree was a special of the evening: Yam Gnocchi with Beef Lengua, or beef tongue. I grew up eating and loving beef tongue, but it's rare to see it being served in a typical restaurant, so when our waitress mentioned this special, I knew I had to have it. This dish exceeded my expectations; the beef tongue was well-seasoned and melted in my mouth, and the yam gnocchi was solid. I wish the beef tongue would become a regular menu item, because I'd love to be able to enjoy it again. And again. And again. R.'s entree was a very tasty Smoked Salmon Sausage that was on the menu, served with couscous, peas tendrils, and cocoa-cranberry jam. I enjoyed my bite; he loved the rest of it. It was a great choice. 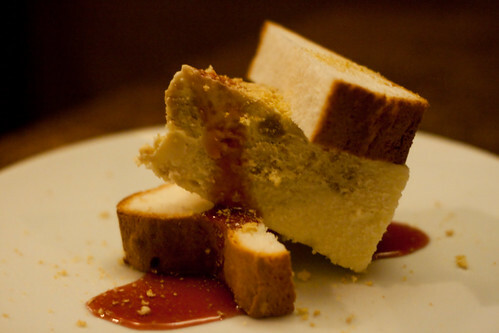 Our dessert was the PB&J Cheesecake, presented in the form of a pseudosandwich. Cute! The middle layer consists of cheesecake with peanut butter Cap'n Crunch drizzled with strawberry sauce. The outer layers consist of angel food cake made to look like Wonder bread slices. It was a delightful way to cap off our meal. Both R. and I thoroughly enjoyed Root 174. 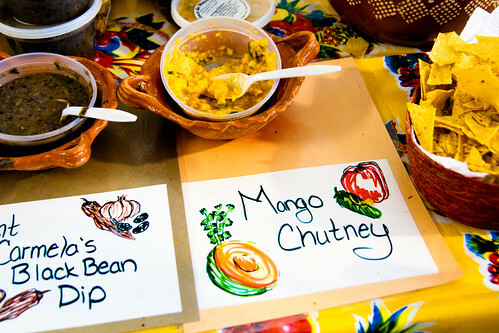 The menu is creative, inspired, and personal. 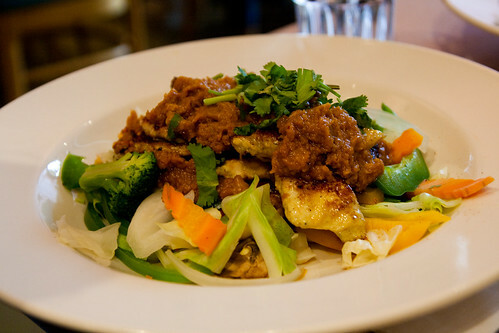 The atmosphere is pleasantly cozy, and the service was attentive. I only wish I lived closer, but even if it's a trek for me, I will be back for sure. Methinks it's time to call up my Swissvale friend. I love all things pumpkin in the fall! 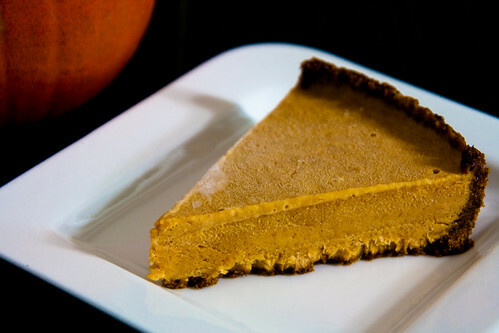 Pumpkin pie is one of my favorite desserts. I discovered this twist on a traditional pumpkin pie a few years ago and had hoped to make it for Thanksgiving at some point, but the fact that I always have to travel for the holiday makes it a practical challenge to prepare and bring a frozen dessert. So finally, this year, I gave up on the idea of saving this pie for Thanksgiving. Instead, I made it and shared it with a few friends at home. I should note that the among these friends were three other food bloggers, so it was pretty risky to serve them a dessert I had never made before! Luckily, they seemed to like it a lot. The gingersnap crust, in particular, got high praise, and I'd have to agree it was a pretty brilliant crust. I bet it'd be a great crust for a pumpkin cheesecake. Also, the use of low-fat ice cream makes this pie a low-calorie treat. 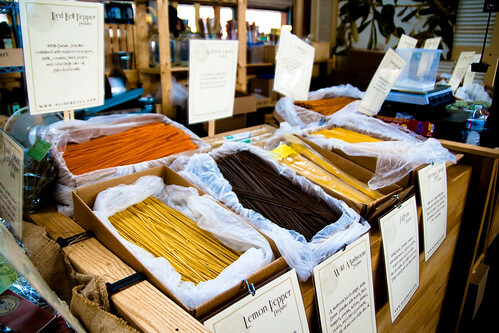 About a month ago I wrote about my love for Olio Fresca Pasta at the Pittsburgh Public Market in the Strip District. Last week, I was bummed to receive an email from the owners, the Pitonis, stating that they will be leaving the Market as of 2012. You see, they live 100 miles away, and it is becoming difficult for them to continue doing business in Pittsburgh. As such, they are looking for someone with a passion for pasta to take over the business, with minimal cost to cover just the equipment. I promised them I would help spread the word. Personally, I think that if Olio Fresca pasta were to leave the Market, it would be a huge loss to the Strip District community. If you or anyone you know would be interested in finding out more about this opportunity, please let me know, and I'd be happy to put you in touch with the owners. Please help spread the word. 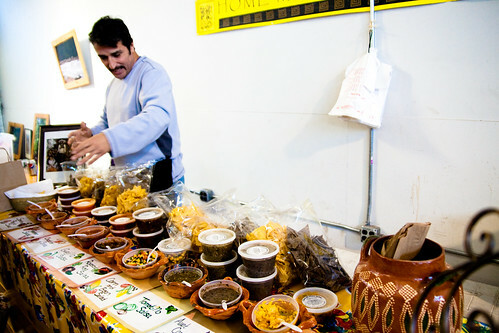 UPDATE 12/12/11: Olio Fresca has made an announcement regarding its plans on their Facebook page. Meat & Potatoes opened a few months ago in the Downtown Cultural District and has quickly garnered some buzz. Among its accolades are winning the "Best Appetizer" and "Dish of the Year" awards at Savor Pittsburgh in September, and just as I was in the midst of composing this post on the gastropub, it goes and gets voted the Best New Restaurant by the Pittsburgh City Paper. No wonder it has become Tom Cruise's choice of dining venue during his time in Pittsburgh! So when my friend suggested going downtown for Light Up Night a few weeks ago, I thought it would be the perfect opportunity to finally check out Meat & Potatoes. Though not by design, this ended up being an interestingly risky meal. Risky, because I decided to choose one dish of which I already had strong preexisting notions, and another that I had completely no expectation whatsoever. First, let's start with the Poutine. A French slang that means "a mess," poutine started out as a diner/street food that's drenched in brown gravy and fresh cheese curd. I don't claim to be an expert on poutine, but being Canadian, it is after all my national comfort dish, so I do know a thing or two about it. Those who have been following my blog know that I have been on something of a quest to find that perfect taste of home in Pittsburgh. While I've had some decent poutine in town, I have yet to find the real deal. And then, several weeks ago I came across this photo by Jennie Roth on Foodspotting of Meat & Potatoes' poutine - the most authentic-looking poutine yet in Pittsburgh! OMGIMUSTHAVETHISPOUTINE!! Ahem. Fast forward to Light Up Night at Meat & Potatoes. I knew that I would absolutely have to try the poutine. 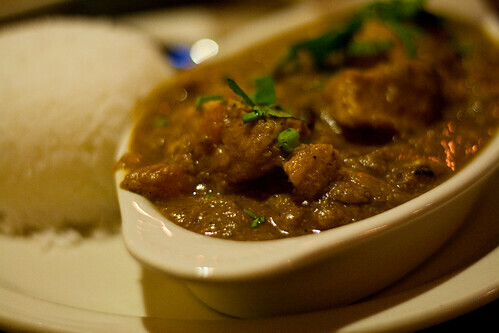 Now, let's take a look at this photo from Foodspotting one more time. Um. The new version of the poutine was waaaay prettier. And also way less authentic. I went to Meat & Potatoes expecting a plate of hot mess, but instead got its prettified, cosmetically-modified cousin from Beverly Hills. 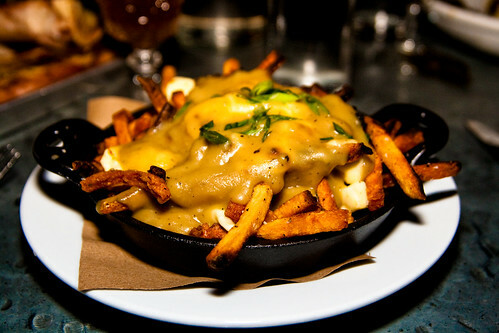 I must admit my heart sank at the sight of my pretty poutine. That said, I have to concede that this poutine was very tasty and well-seasoned - indeed, truly the best tasting poutine I have had yet in Pittsburgh. It may not have the right look, but it certainly has the right taste. So I'll give 'em that. The second dish I ordered was the Bone Marrow. 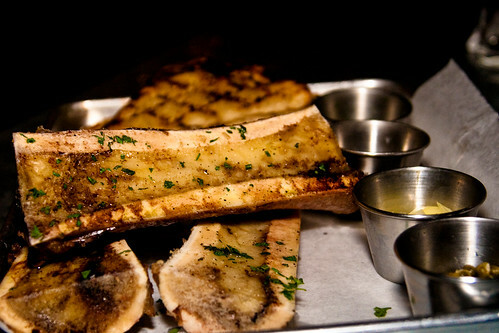 Also a huge risk, because I have never tried bone marrow before and there was a chance I could end up hating it. But, being a rather adventurous eater, I just had to try it once in my life, and I figured Meat & Potatoes would be the place to do it. The appetizer came with three large bones containing the fatty marrow, which I scooped out and spread onto some grilled toast, topped with condiments like sea salt, capers, onions, and gremolata (a parsley/garlic combo - thanks, Google!). I can tell that Meat & Potatoes took good care in choosing the right combination of flavors, as everything tasted great together. Personally, I decided that I am just not that into bone marrow, but that was no fault of Meat & Potatoes'. Bone marrow is just not my thing, I guess. But as I said, I had to try it once, and I'm actually glad I did. 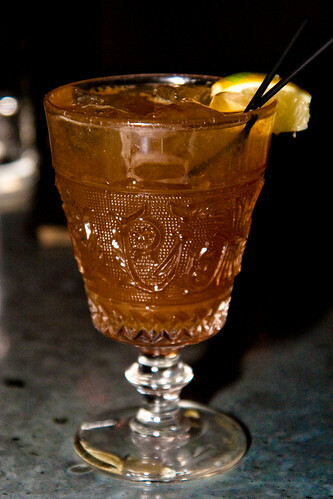 I had heard great things about the cocktails at Meat & Potatoes, so I ordered a Dark & Smokey, with smoked gosling's rum, root liquer, ginger, and lime. Mmm...yum! My friend ordered the Braised Short Ribs for her entree and loved it. In her words, it was the best meal she had had in a long time! Overall, I liked Meat & Potatoes despite my unusual choices, and I'm definitely looking forward to going back and trying some of the more conventional items on the menu. Last weekend I posted a recipe for my Strawberry Soy Smoothie, which took many weeks of experimentation to finally get right. Sadly, strawberries are no longer in season, so I wanted to make a version of my breakfast smoothie that would incorporate more fresh fall flavors. So, I learned to puree pumpkins and started experimenting again! Luckily, it turns out that once you have the smoothie base down, it's easy to switch up the ingredients. 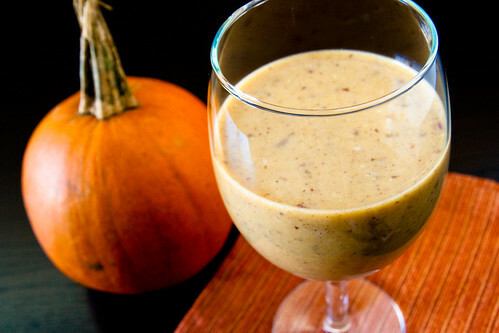 In fact, I think the Pumpkin Spice Soy Smoothie really rocks, if I may say so myself! And low calorie, too! Preheat oven to 400 F. Place the whole pie pumpkin in the oven and roast for 10 minutes. Remove from oven and let cool. Remove seeds and save for another use (such as roasting them). Remove the fibers using kitchen scissors. Place the halved pumpkins, flesh side down, on a baking pan lined with parchment paper. Bake for 25 minutes or until soft. Let cool completely. Scoop up the roasted flesh and place in food processor. Process until smooth. N.B. : If you have a standard size blender or food processor, it may be necessary to split the ingredients in half and complete the procedure twice. Printable versions of the recipe: Caffeinated and non-caffeinated. The holiday season is upon us, and I'm sure you're well aware that our local food banks are in need this time of year more than ever. But did you know that in addition to donating food, there's another way you could help? By donating tote bags to the Pittsburgh Tote Bag Project, a partner of the Greater Pittsburgh Community Food Bank as well as a number of other organizations in the area. How does donating tote bags help those in need? First of all, those who rely on the food bank need secure bags they can use to transport food items home with them. Grocery store plastic bags just don't get the job done sometimes. Secondly, tote bag donations help the food bank cut costs by not having to purchase bags themselves. In addition, because tote bags are reusable, they create less waste, thereby helping save the environment. The Pittsburgh Tote Bag Project collects new and gently used tote bags. The ones that are suitable for transporting food will go to the food bank, but even ones that are unsuitable will be sent to local organizations for other uses, so no bag is wasted. If you have extra tote bags lying around or are able to purchase a few new bags, donate them to the Pittsburgh Tote Bag Project! From now until December 22, The Pittsburgh Tote Bag Project is running a December Donation Drive. Anyone who collects at least 25 tote bags will be entered into a sweet drawing for various prizes, such as a $50 Cheesecake Factory gift card, movie passes, gift baskets, and more. Check out this page for more details. Let's do our part in helping our local community! Every now and then, I think about Korean food. 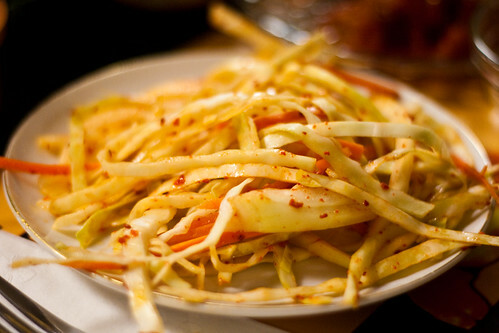 Nowadays, when I think Korean food, I think Golden Pig. And then my stomach starts to growl. I had heard great things about Golden Pig for a while now, but hadn't had the chance to make it out there to Cecil, about 4 miles outside of Bridgeville, until new dining buddy Burgh Gourmand and I talked about meeting up there sometime back in October. Almost a month later, we finally made it, with Señorita Cibulka coming along as well. I was beyond excited, not only to try a restaurant I had wanted to try for the longest time, but also because this would also be my first experience with Korean food in Pittsburgh. 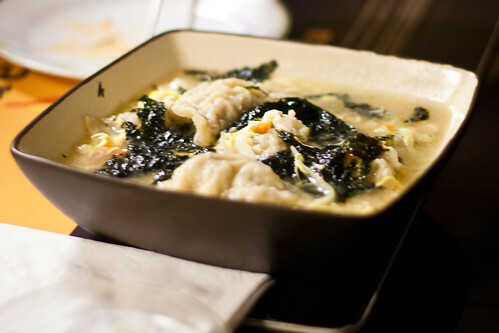 I had so missed Korean cuisine! I had heard that Golden Pig is a small operation before my visit, but holy bulgogi, this place is tiny. Shortly after we arrived, the restaurant filled to absolute capacity, to the point where you couldn't get to the restroom without someone having to move to let you through. And what was the capacity, you ask? A mere 12 people. Though small and casual, Golden Pig is a lovely, cozy restaurant, decorated with various pig paraphernalia - some golden, some not. When I was young I had a bit of an obsession with pigs and even had a pig collection for a while, so this place appealed to my nostalgic side somewhat. Golden Pig is also a one-woman operation - just owner Yong Kwon doing all the prepping, cooking, serving, cleaning, and cashiering. The restaurant was named for Yong Kwon's grandson, who was born in the year of the Golden Pig, a once-every-600-years occurrence that is believed to bring good fortune. Observing Yong cook in her small kitchen from our bar seating, I couldn't help but admire her energy, her dedication, and her pleasant and serene demeanor. If I were in her position, I would probably be totally frazzled. Not her. It was clear that she loved what she was doing. Yong Kwon may be a small woman with a small restaurant, but she has a big heart. When you eat at Golden Pig, Yong is your Korean mom, cooking you the best meal from her heart and always making sure you have everything you need. 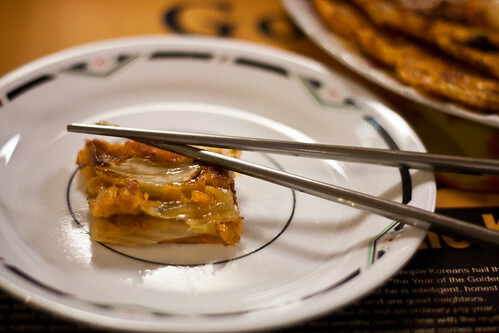 When you eat at Golden Pig, you feel like a welcomed guest at a Korean family dinner. Perhaps most importantly, her food is phenomenal. 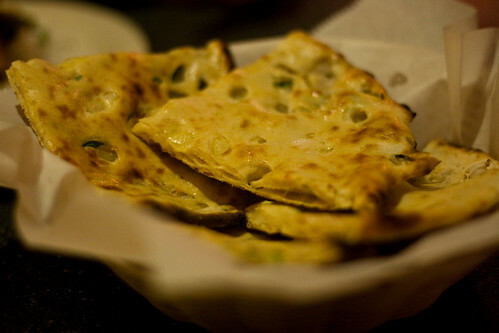 For my appetizer, I went with the Korean Pancake which comes with a choice of kimchi, potatoes, or hot green peppers. 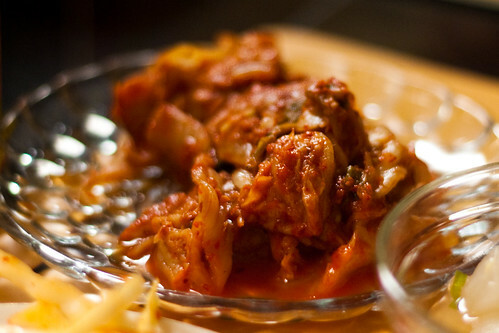 I chose kimchi. Yong warned that the pancake would be huge; I told her I'd share with my companions. And share we did. We ate the whole thing, even though we had plenty of other food, this pancake was simply exquisite. Eating with metal chopsticks is quite different! SC and BG had each ordered an appetizer as well, which they so graciously shared with me. 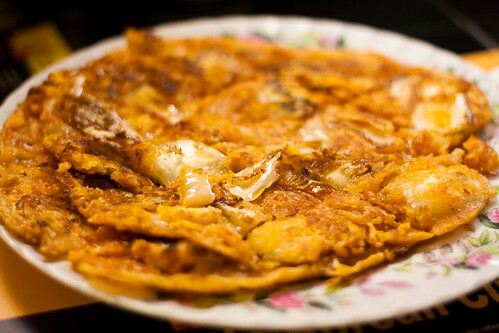 Both the Fried Korean Sweet Potatoes and the Man-Du Soup were every bit as amazing as my Korean Pancake! The entree was a tough choice, as everything on the menu sounded intriguing. I eventually settled on the Man-Du, which are like the beef- and veggie-stuffed dumplings in the Man-Du Soup, only pan fried and served with rice. Just like everything else, these were delicious. I don't have good photos of SC and BG's entrees, but they had ordered the Oh Jing Uh Bockeum (broiled and seasoned spicy squid - $12.95) and the Bulgogi (marinated beef - $11.25). I tried bites of both and can attest to their awesomeness. In fact, I might have to get a full order of bulgogi for myself next time! Beverages at Golden Pig are self-served. 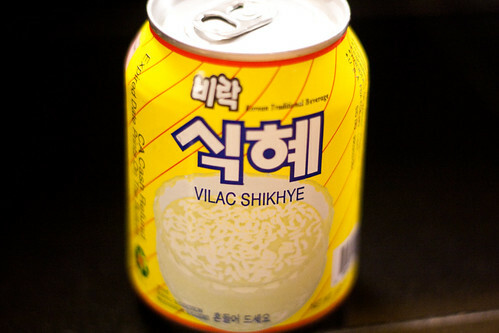 I selected a small can of the rice punch, a traditional sweet Korean drink with bits of rice inside that I've never had before. It sounds like a weird concoction, but it is actually pretty good. As I mentioned before, Golden Pig was my first Korean experience in Pittsburgh, and I'd have to say it's going to be hard to top this one. I loved every single little thing about this place. I am not a superstitious person, but the year of the Golden Pig did indeed bring with it good fortune - to Pittsburgh-area diners, that is. 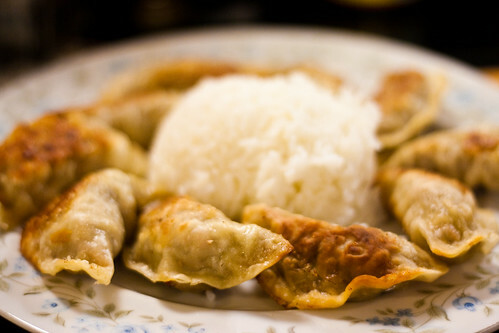 I can't believe how incredibly lucky we are to have such an amazing, authentic Korean restaurant in our own backyard! Also, check out this nice write-up in the Post-Gazette. It was yet another delightful evening at Braddock's American Brasserie downtown at the Renaissance hotel. 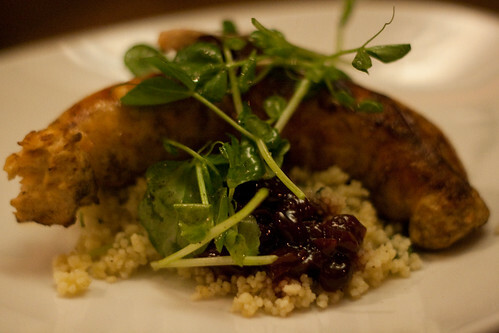 I have been a fan of Braddock's since having enjoyed two memorable meals there. The food is amazing and the service excellent. I had the pleasure of attending a Meetup event there a few weeks ago, and once again, it was a highly pleasant experience. First, Braddock's had arranged a nice little surprise for our group on this particular evening: A complimentary tasting plate with Lobster Gnocchi, Braised Short Rib Pierogie, and Grilled Strip District Kielbasa. 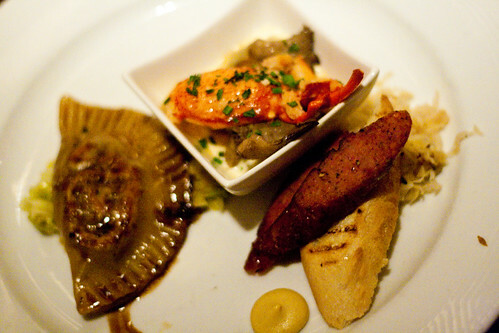 I had had the lobster gnocchi and the braised short rib pierogie before, and already knew how good they are. I was glad that this tasting plate was also highly well-received by others who are new to Braddock's. 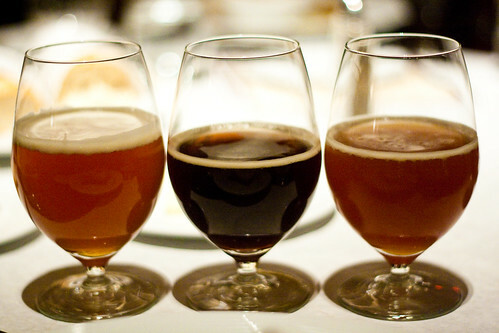 We also had a complementary tasting of beers from East End Brewing and Victory Brewing. People who know me know I'm not much of a beer drinker, but I'm also known to be willing to try before I judge. Of the three, my personal favorite was Victory Brewing's Moonglow - a weizenbock - which I guess is no surprise given that the very first beer I ever liked was also of the weizen variety. Despite not being hungry by this point, I decided to order an entree just to try something I hadn't tried at Braddock's before. I heard the Seared Scallops calling my name and I couldn't refuse. 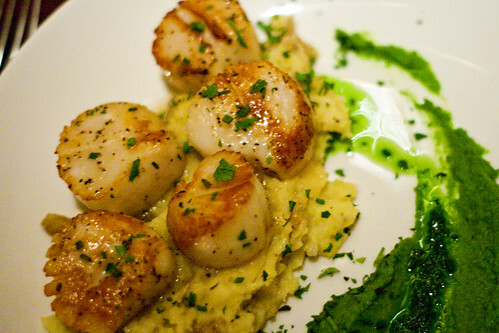 It doesn't look it in the photo, but these scallops were quite substantial in size, and served with mashed fingerling potatoes and pea puree. Several others at my table also ordered the scallops, and we all agreed that they were excellent. About halfway through my entree, I began to realize I had made a tactical error by ordering a big entree and not saving room for dessert. Just thinking about the Warm Fudge Brownie I had at Braddock's last time made me drool! But, regretfully, my stomach just couldn't take a whole dessert this time. 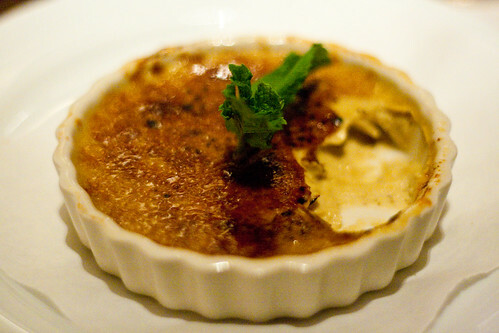 Luckily, someone at my table ordered the Pumpkin Creme Brulee and was sweet enough to passed it around for others to try, so I was able to enjoy at least a bite or two of pure heaven. Gosh, I really wish I hadn't been so full! Throughout our entire meal, the service staff was very professional and attentive. This is the same experience I had had in my past visits as well, so I know they were not just acting the part because it was a special event. Chef Brian Volmrich even came out to greet us, and I made sure to tell him that his is one of my favorite restaurants in Pittsburgh. After yet another great meal at Braddock's, I am ever more convinced of that assessment.